Marquise Vann (No. 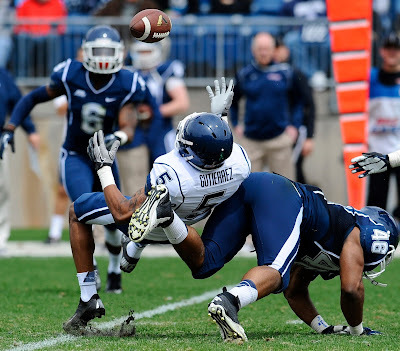 46) made an impact at UConn's spring game. In all the years I've been to spring games whether it is the last two years at UConn or at Yale before that I've never quite figured out how to view these events. When an offensive struggles to run the ball as badly as UConn did on Saturday is that a sign of poor offensive execution or great defense? I guess you could argue that it was a little bit of both. A signal of what kind of day it was likely came when UConn football coach Paul Pasqualoni opened his interview with the media focusing on the players (about 15 of them) who were held out of the scrimmage. The event started with the "back to the wall" drills which is the offense with the ball on the 1 coming out. It did not go particularly well as it took a couple of series before the offense got a first down. When it went to a live 11 on 11 offense against defense with no controlled situations, Chandler Whitmer had some nice throws as he finished 8 of 14 for 140 yards but the offense was unable to score a touchdown as the only scoring came on field goals of 46 and 20 yards by Bobby Puyol. The highlight of the offense were three straight completions by Chandler Whitmer. The first two went Shakim Phillips and the third was to junior Deshon Foxx. Foxx had a 26-yard completion but he stumbled down inside the 1. "I caught the ball and I tried to turn," Foxx said. "I didn’t know where the defender was so I was stumbling getting out of my turn and I stumbled onto the ground. As long as I can help the offense get down there." Foxx had three catches for a team-high 70 yards and during the red-zone drills he scored on a reverse to show off some speed and explosiveness. "I just want to be a threat, just trying to be able to spread the field a little bit and not only make plays for me but help my teammates able to make plays," Foxx said. Defensively, senior defensive lineman Tim Willman had two sacks, starting safeties Ty-Meer Brown and Andrew Adams each had three tackles and an interception while linebackers Jefferson Ashiru and Brandon Steg had three tackles each while Marquise Vann had two near interceptions before finally picking one off during red-zone drills. "It felt good to get out there in front of some fans," Willman said. "It was time for some of the younger guys to step up and play their roles and it will be even better when they are back and we are pretty excited about that."